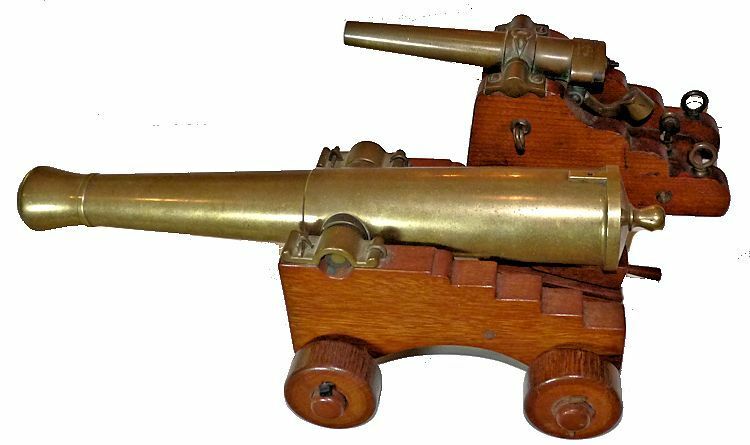 This breech loading signal cannon shown above is a very rare presentation piece that dates from near the time of the Spanish American War. 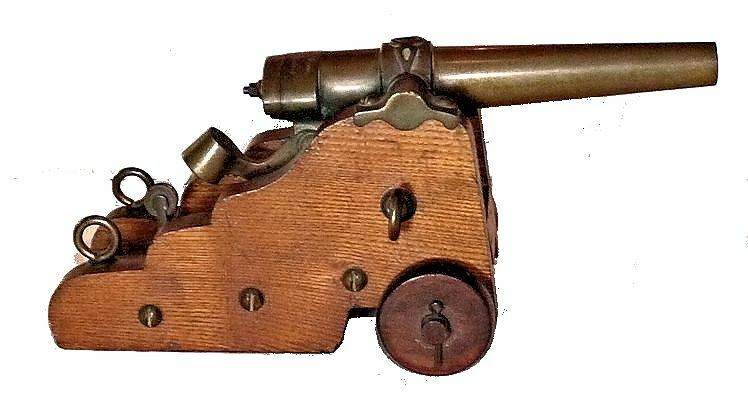 Presented is an unusual bronze barreled breech loading cannon mounted on a ship's type carriage which was presented to Norman L. Green by his grandfather, Leabury in 1899. This was at the close of the Spanish American War. The varnished Oak carriage rides on two oak wheels and has shipboard brass hardware. 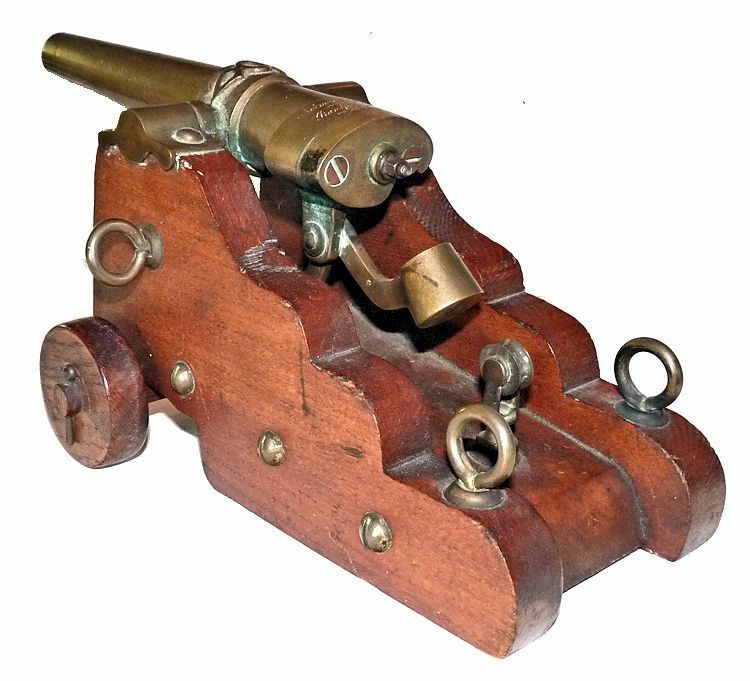 Miniature cannons like this were made for actual signalling and for starting yacht races or by the foundry as an example of its work. There are no foundry markings on this example which is not unusual. 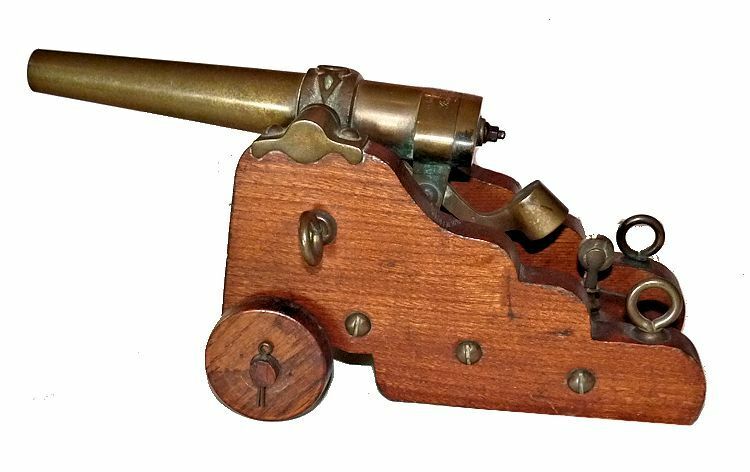 The picture above shows the breech in the closed position with the hammer open. Above the hammer is the firing pin. The hammer is activated by pulling on a lanyard which has gone missing with the passing of time, but that can easily be replaced. The barrel has acquired a pleasing patina that has a very appealing greenish tone. The carriage is made from Oak and is fitted with brass hardware. The bore is free to the touch hole, and shows evidence of being fired. 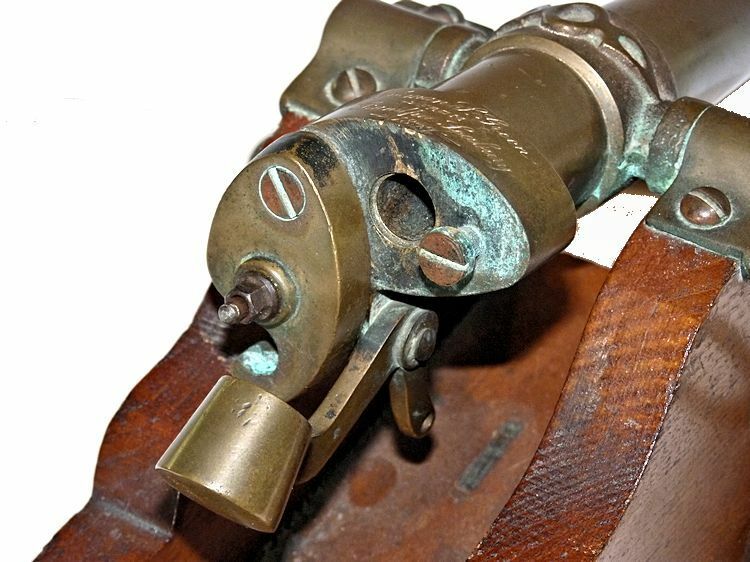 There is an unusual geometric design over the center of the barrel which can't be identified. The trunnions are located at the center of the tube and are held by heavy, closed end, trunnion caps, an unusual design. Maximum diameter of tube 1.24" At 1st ring 1.16" . 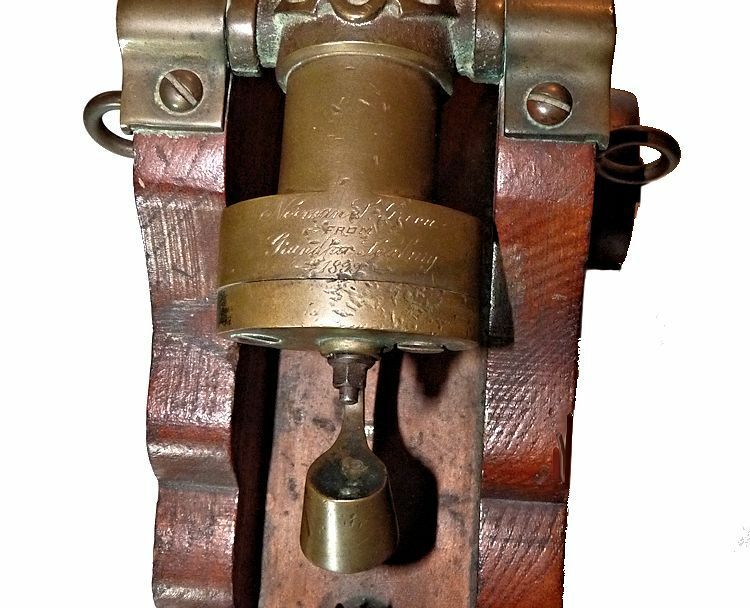 Picture shows the open breech below and the engraving above. 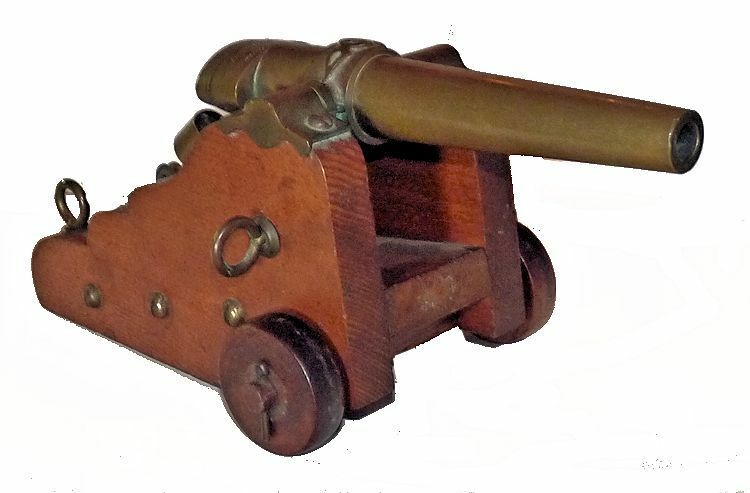 PROVENANCE: The cannon was acquired in the normal course of business at an auction. CONDITION: There is a raised geometric design on the top of the reinforcing ring. The medium green patina seems to show natural ageing and has an even cast over the length. We did not attempt to put a 45 Cal. cartridge in the chamber. The firing lanyard is missing. The wood carriage is in excellent condition with all of its varnish present. There are some minor marks of age as expected. There are no mold marks or maker's mark on the barrel. It is being sold for display and should not be fired. The picture below shows it's size relative to a Civil War Era ship's cannon that measures 16" in overall length and weighs 14 pounds.